1. the large, dark-red gland in the upper part of the abdomen on the right side, just beneath the diaphragm. Its functions include storage and filtration of blood, secretion of bile, conversion of sugars into glycogen, and many other metabolic activities. 2. the same gland of certain animals, sometimes used as food or from which pharmaceutical products are prepared. fatty liver one affected with fatty infiltration, the fat in large droplets and the liver enlarged but of normal consistency. hobnail liver a liver whose surface is marked with nail-like points from cirrhosis. 1. A large, reddish-brown, glandular organ in the abdominal cavity of vertebrates that secretes bile and is active in the formation of certain blood proteins and in the metabolism of carbohydrates, fats, and proteins. 2. An organ in invertebrates that is similar to the vertebrate liver. 3. The bile-secreting organ of certain animals, used as food. 4. A dark reddish brown. 1. Made of or flavored with liver: liver pâté. 2. Of a dark reddish brown. the largest gland of the body and one of its most complex organs. It is located in the upper cranial, right part of the abdominal cavity, occupying almost the entire right hypochondrium and the greater part of the epigastrium. In many individuals it extends into the left hypochondrium as far as the mammary line. It has a soft solid consistency, is shaped like an irregular hemisphere, and is dark reddish-brown. The ventral part of the liver is separated by the diaphragm from the sixth to the tenth ribs on the right side and from the seventh and eighth costal cartilages on the left side. The central section has a deep concavity that fits the vertebral column and the crura of the diaphragm. The liver is divided into four lobes, contains as many as 100,000 lobules, and is served by two distinct blood supplies. The hepatic artery conveys oxygenated blood to the liver, and the hepatic portal vein conveys nutrient-filled blood from the stomach and the intestines. At any given moment the liver holds about 1 pint of blood, or approximately 13% of the total blood supply of the body. 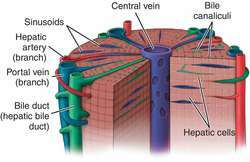 The tiny lobules of the organ are composed of polyhedral hepatic cells. These cells communicate with small ducts that connect with larger ducts to form the left and right hepatic ducts that emerge on the caudal surface of the liver. The left and right hepatic ducts converge to form the single hepatic duct, which conveys the bile to the duodenum and gallbladder for storage. 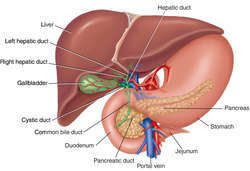 More than 500 functions of the liver have been identified. Some of the major functions are the production of bile by hepatic cells; the secretion of glucose, proteins, vitamins, fats, and most of the other compounds used by the body; the processing of hemoglobin for vital use of its iron content; and the conversion of poisonous ammonia to urea. 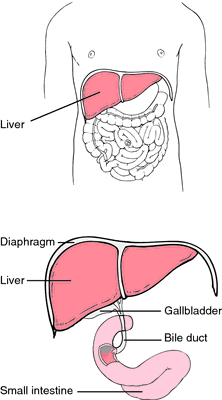 Bile from the liver is stored in the hepatic duct, in numerous blood vessels and in the gallbladder, which is connected to the liver by connective tissue. 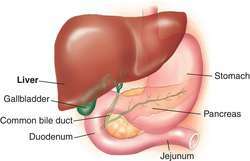 The liver cells produce about 1 pint of bile daily. The hepatic cells also detoxify numerous ingested substances, such as alcohol, nicotine, and other poisons, as well as various toxic substances produced by the intestine. See also gallbladder. The liver is one of the most metabolically active organs of the body. Amino acid metabolism: It synthesizes nonessential amino acids, deaminates excess amino acids for use in energy production, and forms urea, which the kidneys excrete. Bile production: It is responsible for the production of bile salts, which emulsify fats in the small intestine; 800 to 1000 ml of bile is secreted in 24 hr, and the secretion rate is increased greatly during digestion of meals rich in fats. Carbohydrate metabolism: It converts monosaccharides other than glucose to glucose, and stores excess glucose as the starch glycogen, until such energy is needed. Detoxification: It produces enzymes to metabolize potentially harmful substances found in the portal circulation (e.g., alcohol, ammonia, indole, many medications, and skatole) into less toxic ones. Endocrine functions: It facilitates the conversion of levothyroxine to the more metabolically active thyroid hormone, triiodothyronine. Excretion: It discharges the breakdown products of hemoglobin (bilirubin and biliverdin) into the bile; these are eliminated in feces. Fat metabolism: It synthesizes cholesterol as well as lipoproteins for the transport of fat to other body tissues; it converts fatty acids to acetyl groups or ketones, so they may be used as energy sources. Phagocytosis: Its macrophages (Kupffer cells) scavenge bacteria, other pathogens, and senescent red blood cells from the portal circulation. Protein synthesis: It manufactures albumin, alpha-globulins and beta-globulins, complement components, and clotting factors, some of which are dependent on vitamin K. Storage: It stores copper, iron, vitamin B12, and the fat-soluble vitamins A, D, E, and K.
The liver is examined by inspection, auscultation, percussion, and palpation. Inspection of the organ includes indirect assessments (e.g., for jaundice [skin color], palmar erythema, and spider telangiectasias and other signs of chronic liver disease. Auscultation of the liver may reveal bruits associated with liver cancer; auscultation also is used to make a crude estimate of organ size. Percussion of the liver, which is performed in the right midclavicular line, provides another method for roughly estimating size. Palpation of the organ may reveal tenderness, irregular edges, masses, or tumors. The largest organ of the ABDOMEN occupying the upper right corner and extending across the midline to the left side. It is wedge-shaped, with the thin edge pointing to the left, of a spongy consistency, reddish-brown in colour and moulded to fit under the domed DIAPHRAGM so that most of it lies behind the ribs. The liver receives chemical substances in the blood, especially in the nutrient-rich blood from the intestines (glucose, amino acids, fats, minerals and vitamins) and processes these according to the needs of the body. It takes up the products of old red blood cells and converts these into a pigment, bilirubin, which together with other substances, form the bile. It breaks down toxic substances into safer forms. Ammonia produced from protein breakdown is converted into urea, which is excreted in the urine. Alcohol and other drugs are altered to safer forms. To a remarkable degree, the liver is able to regenerate itself after disease, toxic damage or injury. But if this capacity is exceeded, functional liver cells form nodules and are replaced by inert fibrous tissue (CIRRHOSIS) and the whole function of the body is severely affected. removes excess glucose from the blood and stores it as GLYCOGEN. converts glycogen back to glucose when blood sugar levels are low. converts food substances to other types, e.g. carbohydrates into fats, amino acids into carbohydrates or fats. deaminates amino acids, converting the ammonia produced into urea via the ORNITHINE CYCLE, releasing the nitrogenous wastes into the blood. transaminates amino acids (see TRANSAMINATION from one type to another via keto acids. manufacturers fats, including cholesterol. (h) manufacturers many plasma proteins, including FIBRINOGEN and PROTHROMBIN. stores several important substances, e.g. iron and fat-soluble vitamins. destroys worn-out red blood cells. A solid organ located on the right in the upper abdomen. It plays a major role in metabolism, digestion, detoxification, and elimination of substances from the body. large organ in the right upper part of the abdominal cavity, immediately below the diaphragm, and protected by the lower ribs. Its many vital functions include nutrient metabolism (protein synthesis, formation and storage of glycogen and its breakdown to provide glucose to the blood); production of bile for storage in the attached gall bladder and discharge into the gut; detoxification of drugs; regulation of cholesterol. Because of its size and metabolic activity, the liver generates considerable heat. As well as its own arterial blood supply, the liver receives all venous blood from the gut in the portal vein, enabling selective uptake of absorbed substances before they reach the general circulation. The largest gland of the body, lying beneath the diaphragm in the right hypochondrium and upper part of the epigastric region; it is of irregular shape and weighs from 1-2 kg, or about one fortieth weight of body. Detoxifies drugs and many exogeneous substances and is also of great importance in fat, carbohydrate, and protein metabolism. n complex organ with many functions. Main functions include filtration of the blood, production of blood cells, and synthesis of blood-clotting components. It is divided into four lobes, with each containing thousands of lobules, and is served by two distinct blood supplies. The hepatic artery conveys oxygenated blood to the liver, and the hepatic portal vein conveys nutrient-filled blood from the stomach and the intestines. Q. Why do I have Fatty Liver? I have just had a complete overhaul regarding my health and thankfully the only thing that came back was that I had fatty liver, now I don`t drink, never have, I`m not desperately overweight although have lost 4 stone over a period of time, and I like to think that I eat sensibly, salads, fruit, veg.. Any thoughts anyone? A. The scholars investigate and find, eight in ten fat people have fatty liver. The main reason is that a large amount of dissociative fat acid in blood is gradually transferred to liver and this overburdens the metabolism ability of liver then leads the fat accumulated and finally the fatty liver formed. More than half the patients with type 2 diabetes mellitus associated with fatty liver. Dextrose and fat acid can’t get a good use and obstacle appears in lipoprotein synthesizing. When dextrose and fat acid change into fat in liver, this will lead fat accumulation and finally fatty liver formed. Q. What are the risks of cirrhosis of liver? My dad has cirrhosis and I would like to know what are the risks and how does it get treated. Q. What is Liver Cirrhosis? I read that alcohol can lead to liver cirrhosis. What does cirrhosis mean? A. The word "cirrhosis" is a neologism that derives from Greek kirrhos, meaning "orange-yellow". In this condition, the liver appears yellow in pathology from all the tissue changes and damage caused to it. Cirrhosis has many possible causes. Sometimes more than one cause is present in the same patient. In the Western World, chronic alcoholism and hepatitis C are the most common causes. The sick liver gradually loses its function, therefore leading to end stage liver disease that ultimately requires liver transplant.